A.J. Stack, left, is sworn in as the new Gallipolis Rotary President by Craig Maxey, right, district governor. 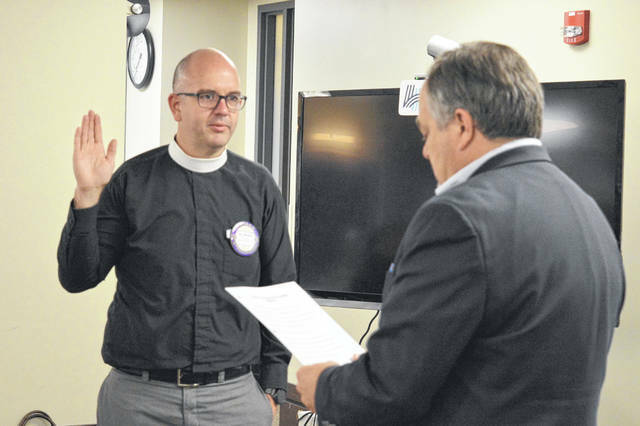 GALLIPOLIS — Gallipolis Rotary installed its new president for its upcoming year at the Holzer Medical Center during its regular meeting Tuesday morning. Previous President Jenny Evans passed the reigns to Saint Peter’s Episcopal Church Priest-in-Charge A.J. Stack to serve as the new president of Gallipolis Rotary. District Governor Craig Maxey was present to swear Stack in with Assistant Governor Greg Ervin to introduce Maxey. Stack said the local club has made it its stated mission to focus “a lot of its energy on the opioid epidemic.” Nationally and internationally, Rotary has focused much of its efforts on eliminating the polio virus as well. The Rotary Mile set to run July 4 is one of the clubs initiatives to support the battle against polio. For more information, visit Gallipolisrotary.org or email Stack at fr.aj.stack@gmail.com.